The English seaside is often thought of as environmentally blighted, socially segregated and economically depressed. Andy Tuohy’s literally sees this world in a different light. 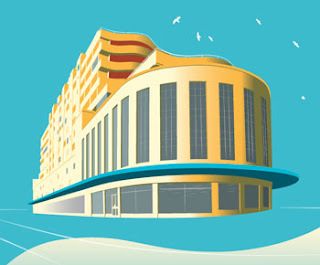 Familiar icons of seaside architecture are represented so as to draw attention to the progressive potential of building design and to the utopian ambitions associated with seaside resorts and their development. These pictures are the beginning of a project that re-examines relatively recent architecture along our coast and draws attention to the quality, sophistication and wit of seaside modernism. The project acts as a powerful argument against the prevailing orthodoxy of decline and, at the same time, warns against any knee-jerk retreat to historical pastiche.